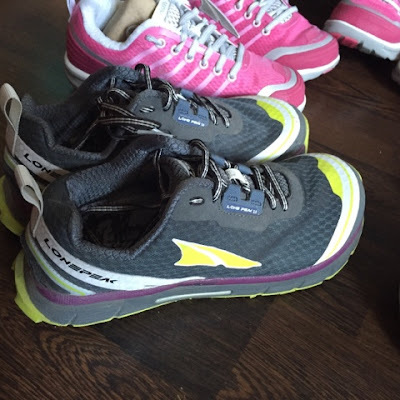 I discovered Altra Runners back in March 2015 at the Rock N Roll Half Marathon Expo in San Francisco. Greg had been wanting to try them out for ages but no where in Calgary seemed to carry them and they are quite pricy in Canada. He was excited to see they had a booth at the expo and that they were selling old models for really cheap. Unfortunately for him, they had no running shoes in his size, just the first edition of the Lone Peaks in bright red. He bought them and still loves hiking in them. He has already had to shoe goo them so they don't fall apart on him. I was able to find a pair and even though I didn't love how they looked, I bought them. My favourite New Balance shoe had worn out and I had struggled to find a pair of new running shoes I loved since they had changed the model that I previously had and I didn't like it. In 14 months since the expo, I have bought 4 more pairs. These are my first pair of Altras. They are Intuitions 2.0's. They are so ugly. They are a really awkward looking shoe but the colours of this shoe didn't help the matter either. I hate all things blue and thought they were gross but as I started running in them, I didn't care how ugly they might be, they were the most fantastic shoe in the world. I love them because of the wide toe box, they are comfy and they are light. I hate heavy shoes with a passion. I pick up some at shoe stores and am boggled how anybody can run in them. 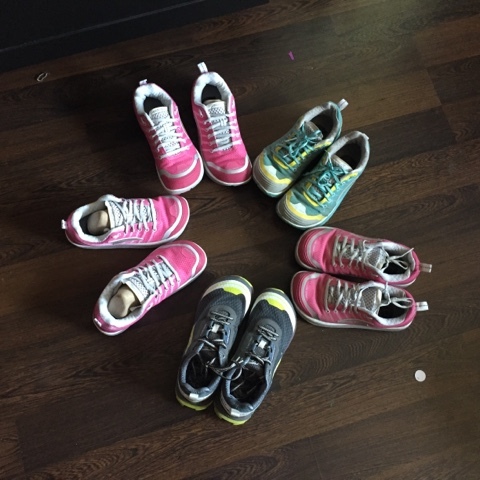 These ran 2 marathons and tons of training and are now relegated to Bootcamp shoes. They have had shoe goo on the sides because they outer layer was starting to rip and I didn't want the inner layer to rip either. Intuition 1.0 was voted best debut in 2012 and the 2.0's had more foam to make for a softer landing which was to help transition to a zero drop shoe. I found out the pink pair existed by accident. 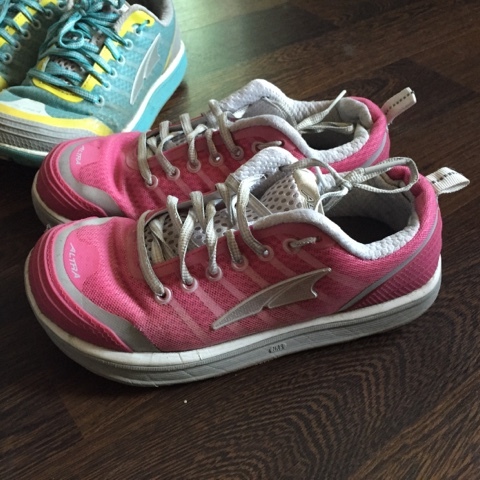 I think I was on Instagram scrolling through the discovery section of the app and a runner's photo caught my eye and as I was creeping their profile, I came across pink Intuition 2.0's. I immediately went to their website and they had none on there, so then I googled them and found some on Amazon that could be shipped to Canada. I think for the shoe, shipping and duty it was about $70CDN but the dollar was still decent then. My blue shoes were relegated to rainy runs while these were reserved for sunny runs although I did wear these ones at the SeaWheeze in Vancouver and it was wet and I was legit worried they would get dirty and I would be devastated. Thankfully they survived. 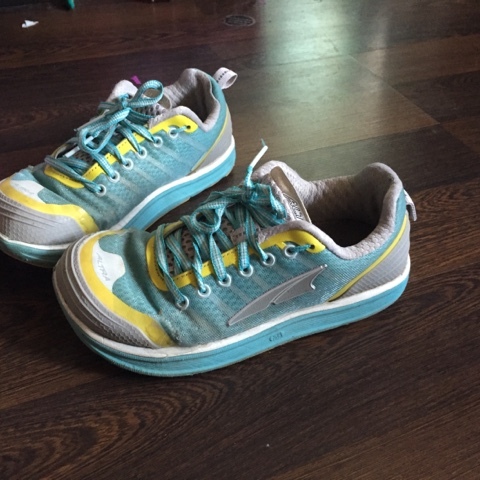 In April, Altra's had the Intuition 3.0's on sale for $90 cdn but I couldn't buy them until I was certain Greg wouldn't be laid off and when we knew he wouldn't, the sale was over. I really needed a new pair of shoes, so Greg scoured the internet and found them on Amazon for $33 a pair plus shipping and duty so I bought 2 pairs for a total of $117cdn which is really awesome. For Christmas, I got the Altra Lone Peaks which is a trail runner and hiking shoe. Trail runner's are great for winter running and I got rid of my hiking shoes almost 2 years ago after Lake Bourgeau and had never replaced them. It was always my excuse to not going hiking ahahaha. These are also zero drop with the foam platform and wide toe box. And they are super light. And they are pretty which is always nice too. Needless to say, I love Altra Runners and I recommend them to everybody and anybody. The Running Room has started to sell them and they can be found at Striders in Canyon Meadows if you live in the Calgary area. You can also order them online from Altrarunning.ca too. If you love the shoe but not the price, you can always try them on in store and try finding them online like I do. I need to do this because $140 a shoe gets really expensive if you run a lot! !